Last week I mentioned some trouble with the heel of my Leyburn sock. The pattern says to make a short-row heel, but mine always come out with holes in them so I decided to try a toe-up heel flap construction, based on the instructions in Sensational Knitted Socks (which is totally my sock bible!) The odd thing is that the Leyburns are constructed in such a way that you have many more instep stitches than heel stitches, rather than dividing them in half as usual. I wasn't sure how it would come out, but I followed the SKS instructions anyhow - not exactly because my stitch count was different and I needed a larger number of heel flap rows, but it seemed to work out pretty well. I've never made a toe-up heel flap before, and in the middle of this one I learned on Ravelry that there's another more sensible-sounding way to do it, but I stuck with these instructions anyhow. 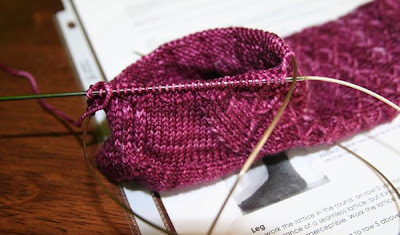 When all was said and done and the heel was formed and the gusset properly decreased, the sock fit AND had the correct number of stitches, which was nothing short of miraculous! Now, all I have to do is continue on my merry way, knitting the quilted lattice pattern in the round for the rest of the sock. I suspected that perhaps I shouldn't begin the first round exactly the way the instructions say to, but then I did a little math and it seemed to come out right. But no. Do you see that little row of upraised arms at the very top? (I know it is hard to see, but trust me.) They should all be shifted to the left or right a few stitches so they form X's with the row below. I have to undo those 4 rows and figure out how to fix them. It's possible I was simply supposed to start the round elsewhere, but I don't actually know. It's a little complicated because the stitch pattern involves slipping 5 stitches at once with the yarn in front to make a float, and you can't just start a round in the middle of that. I'm a little frustrated with the pattern, but it WAS free so I can't complain. Despite the difficulties I'm having, I love how the sock is coming out and that is the only reason I'm still sticking with it. It's worth it! Also? I think spring is here. 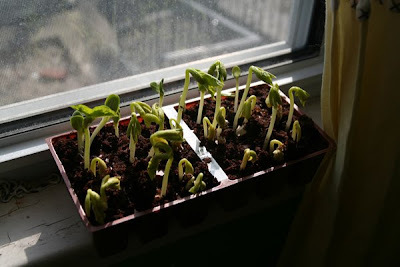 These will (hopefully) become string beans and pumpkins. 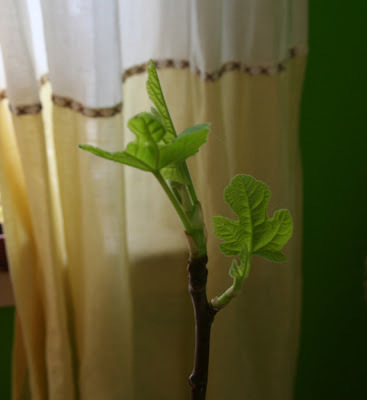 The fig tree is coming out of dormancy too. Is that enough green for St. Patrick's Day? Ditto on the Leyburn socks! I managed to produce two short-row heels WITHOUT HOLES after much internet and Ravelry research. Having jumped that hurdle, I ran into the same problem with having upside-down Vs instead of Xs. Yet nobody else on Ravelry or anywhere mentioned a problem with the pattern. What the hell? They are now in hibernation because I just can't look at them anymore as a result of my frustration. They may become a Baby Surprise Jacket. How frustrating. But we can't be the only two people who have had this problem, right? 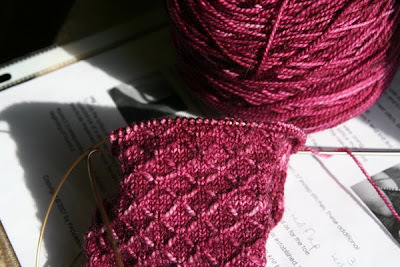 I haven't looked through the whole thread, so I have no ideas if this is addressed there or not, but the Socks that Rawk Rav group was doing a Leyburn KAL, and the thread is still stickied in the group, so it's possible there is some help in there? Although it looks like a lot of people did theirs cuff-down, so I don't know. Worth a shot, though! Thanks! I did check Ravelry, but I'm not in that group. I'll take a look! I checked that KAL for days when I was having this problem and didn't find a thing. I searched every Leyburn project on there and googled the heck out of it, but still nada. Maybe you'll have better luck. If you're able to correct it, please blog about it. These are in a shoebox in my closet just waiting to be fixed.